For nearly 48 hours, Tom Savage was not a 49ers employee. That will change soon, with Pro Football Talk reporting (Twitter link) the quarterback will re-sign with the team. The 49ers cut Savage on Saturday to make room for a reinforcement in an injured secondary, but the rumors circulating the team planned to bring the quarterback back look accurate. Savage will return as a veteran presence on a young passing staff, though his job security should certainly be considered tenuous based on recent events. San Francisco brought in Savage last week to work behind C.J. Beathard and rookie Nick Mullens. He’s back in that capacity, at least for now. 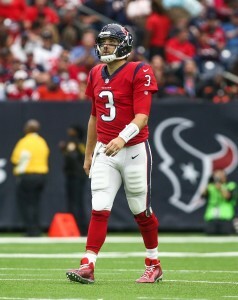 The Texans’ 2017 opening day starter, Savage was benched last season but returned to action after Deshaun Watson‘s ACL tear. The Texans did not re-sign Savage this offseason, and a Teddy Bridgewater trade led to the Saints cutting Savage after they’d reached an offseason agreement with the fifth-year passer.